You have added Black Embellished Neckline Designer Pencil Dress into shopping cart. FINAL SALE. 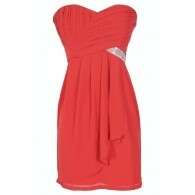 This dress is one part sophisticated and chic and one part fun and festive. The Black Embellished Neckline Designer Pencil Dress is fully lined and crafted of a knit fabric with a bit of stretch to it. 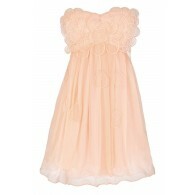 It has a rounded neckline, princess pleats down the front, and fabric cutout in the back. The standout detail of this chic dress is the black beading embellishment at the neckline and chest that gives it an unexpected touch. This dress would look great worn with black pumps and a cute clutch purse—or punch it up with a bright, unexpected color. Details: Fully lined. Invisible back zipper. 95% polyester, 5% spandex. Lining: 100% polyester. Dry clean only. Small measurements: Length from top of shoulder to hemline: 34”. Bust: 32-34”. 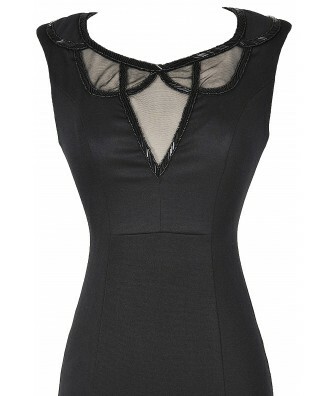 You have added Black Embellished Neckline Designer Pencil Dress into Wishlist. You have added Black Embellished Neckline Designer Pencil Dress for Stock Notification. You have set Black Embellished Neckline Designer Pencil Dress as a loved product. You have removed Black Embellished Neckline Designer Pencil Dress as a loved product.